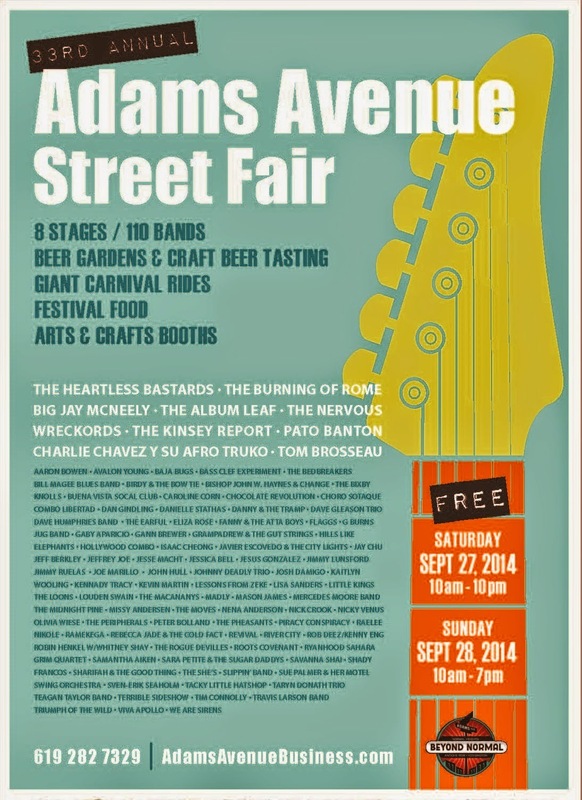 The Adams Avenue Street Fair, Southern California’s largest free, two-day music festival, will celebrate its 33rd anniversary this Saturday, September 27, from 10am-10ppm, and Sunday, September 28, from 10am-7pm, on Adams Avenue, located in the Normal Heights community of San Diego. Over the past 32 years, the Adams Avenue Street Fair has featured the best in local, regional, national and international artists - many of whom are Grammy Award nominees and winners, as well as Rock & Roll Hall of Fame inductees. Headliners for this year's event will include the Austin-based quartet Heartless Bastards, San Diego rockers the Burning of Rome, R&B tenor saxophonist Big Jay McNeely, indie artists the Album Leaf, the Nervous Wreckords, featuring former Louis XIV guitarist Brian Karscig, Indiana’s blues/rock/funk trio the Kinsey Report, English reggae singer/toaster Pato Banton, Johnny Cash tribute band Cash’d Out, singer/songwriter Tom Brosseau, and salsa band Charlie Chavez y su Afro Truko. More than 110 musical acts will be performing on eight stages on Adams Avenue, Adams Avenue Park, Lestat’s coffee house, and the new addition of Java Joe’s. In addition to the musical line-up, there will be beer gardens, a craft beer tasting area, giant carnival rides, and more than 300 vendors selling their specialties throughout the festival venue.